The glass jars, opaque bags and other packaging material that contain cannabis have become more important to dispensary businesses as the U.S. marijuana market has grown. Packaging can create a dispensary’s brand identity and help market specific strains and products. And under many states’ marijuana laws, packaging must meet defined child-resistant standards. The expansion of the packaging market has created competing business models. Some companies design and manufacture these products in the United States; others purchase the products from U.S.-based manufacturers and then market them to the cannabis industry. And some companies import the products from Asia. Each business model has its own advantages and drawbacks. U.S.-based companies that design and manufacture their packaging products hold a huge advantage in the turnaround time from request to delivery. This can be advantageous to dispensaries that need custom products to be produced in a short window of time. Domestic manufactures can also flourish when recreational economies take effect. In Colorado, for example, the state established packaging rules just months before the recreational economy started. Retailers had to scramble to find packaging. Ken Loritz, owner of CoolJarz, said his company can roll out a new custom product in just two weeks. CoolJarz manufactures its plastic screw- and pop-top jars in a 20,000-square-foot facility in Irvine, California. Loritz said many of his customers are attracted to his Made in the USA tagline. He also believes his products are of higher quality than products manufactured overseas. But Loritz’ products do cost more than others on the market, and he said that he can surrender almost 10% in wholesale cost on some items. Chinese manufacturers can produce packaging products for pennies and deliver enormous numbers of these products to West Coast ports. For cost-conscious dispensaries, the economies of scale in Asian products can cut a sizable chunk out of top-line expenses. Arnold Heckman, owner of Maryland-based Cannaline, designs his products in the U.S. and then imports his glass jars and opaque bags from China in 40-foot containers that arrive each month. Each order contains up to 500,000 jars and more than a million bags. Heckman said that when Cannaline came into the cannabis market, glass jars sold for $5 at wholesale. Cannaline sold theirs for $1.55 and quickly grabbed market share. Today, the basic jars cost around 80 cents. In Asia, raw materials, energy and labor are cheap. In the U.S., simply creating a new mold for product manufacturing can cost upwards of $350,000. In Asia, the cost is 10 times less. But Heckman said he requires up to four months of lead time to create a custom design, and four months to a year to create an entirely new product. 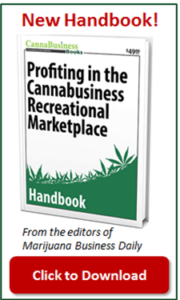 The slow turnaround has kept Heckman from doing business in Colorado’s recreational market. Packaging companies that purchase products and resell them can cherry pick from high-quality and creative designs that come from other industries. For dispensaries and retail shops that are looking for unique designs, these manufacturers pose an attractive product. The California-based Kush Bottles, for example, secured exclusive rights to sell products made from a manufacturer in Erie, Pennsylvania, that makes child-resistant bottles for the pharmaceutical industry. The manufacturer had already designed its products up to FDA standards, so Kush Bottles did not have to pay research and development costs. The bottles have an easy pop top, and they also meet Colorado’s child-proof restrictions. Ben Wu, owner of Kush Bottles, said he emphasizes his product’s safety record when selling to the industry. But since these companies pay a licensing fee to the manufacturer, which has invested hundreds of thousands of dollars in product development, they can’t always compete with Asian products – or even those manufactured in the U.S. – on price. Wu, however, said that has not stifled is company’s growth. Yeah I couldn’t agree more that the quality of packaging says alot about the brand identity. I am always looking for a slick glass container.. Have anyone heard about Re-Stash. I am considering them for my store.